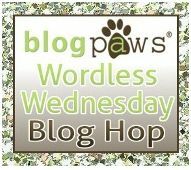 Bringing up Bella: Wordless Wednesday 63 - Trick or treat? So this is about as close as I could get to Bella in a Halloween costume. It comes compliments of Hurricane Sandy. Trick or Treat? I'm pretty sure I know what Bella thinks. If it's possible for dogs to frown, I think Bella has managed it. The small coastal community of Matunck, RI where we recently vacationed which was decimated by the storm. We wish you all peace and strength as you rebuild. Bella looks about as impressed as my dog with the whole costume thing. Doesn't she know that dogs dressed up are usually dogs who get treats? I hope you were free from the disaster of the hurricane. As the reports continue to roll in, I feel so lucky that Halifax remained clear of the worst. Wow, Bella's grumpy face rivals Miss M from Two Pitties in the City; I didn't think it could be done! She looks about as PO'ed as I've ever seen her! You told her that it's really to keep her nice soft coat dry, right? Without laughing?? Oh Bella, if looks could kill.. BOL! Bella does not look impressed! Glad you guys are okay and our thoughts are with those who didn't fair to well through Sandy. She sure doesn't look happy, does she? Happy Halloween! Oh Bella is adorable! I feel a little guilty now that Bunny is such a good sport about doing costumes for me. She is just so easygoing, and a natural ham! Bella doesn't look too thrilled with her Halloween costume! Have a Happy Halloween! Poor Bella! Cali won't dress up either! Why are you frowning, is it the outfit? Don't worry its only once a year and it makes the humans laugh...not at you but with you. Hopefully when the barometer edges up Bella's frown will go into hiding. Glad to hear you came through ok. Most assuredly dogs can frown. Bettina has raised it to an art form. Aw, Bella :( Don't look so sad! Bella really does have a frown. Poor pup.